It’s not always like this… | Twende pamoja! “They don’t want the Government to increase tuition fees. But then the Government said they weren’t planning to do that so they changed to protesting to get fees reduced”. I (sort of) could have been having this conversation in the UK. The slight difference was the tear gas that had everyone in the room hugging hankies to their faces and sneezing like we had all developed severe cat allergies. We’d received the security warning the night before: all state university students were planning protests starting at 9am. The advice was to avoid the city centre – especially if you were driving so as to avoid scratches to your car from stone throwing and protracted insurance claims. My office is right next door to the University of Nairobi, home to the most notoriously violent students in town. I’ve no idea how such rankings are calculated but this is what I’m told! I decided to run to work early to get into the compound before anything kicked off and all was peaceful until about 10am. Then the shouting started. And the pops of tear gas canisters. By lunch I’d almost stopped noticing what was going on outside with it becoming some sort of bizarre backing track to the report I was writing. But by 2pm the air was so thick with tear gas that my eyes were running even sitting in my office with all the windows closed. Courtesy of Twitter I was able to follow what was going on outside (and borrow these photos – thanks Twitter!). This is the road running outside of my office in one direction – it’s normally jammed with traffic. We left the askari’s (security guards) locking the gate and skirted round to the back entrance where there was a heavy riot police presence trying to keep the road open to cars. We decided the time was ripe to make a dash for it! Five minutes later and I was past the “front line” and strolling through the eerily quiet city centre. Nairobi is no stranger to these protests that get slightly hairy. A couple of months ago it was the matatu drivers protesting new government regulations that brought the city to a standstill. But so far I’ve never really felt scared and it’s been relatively easy to keep clear of trouble. To be honest I almost didn’t write this post. In light of the bad press Kenya is getting right now I didn’t want to fuel anymore negative impressions! But this is a small part of the reality of life here. It’s not an easy city. Bad stuff happens. Is happening. I would be lying if I said there wasn’t a funny mood “in the air” right now in the wake of the recent bombings and the increasing anxiety about what will happen next. Chat on the expat Facebook forums is full of questions about what the latest security alerts are. But that’s part of the problem. The rumours, the scaremongering, the spreading of fake security updates (alongside the real one’s of course) which, to be fair, many UN workers excellently go to lengths online to counter and explain that no such alert has been put out by their employers. 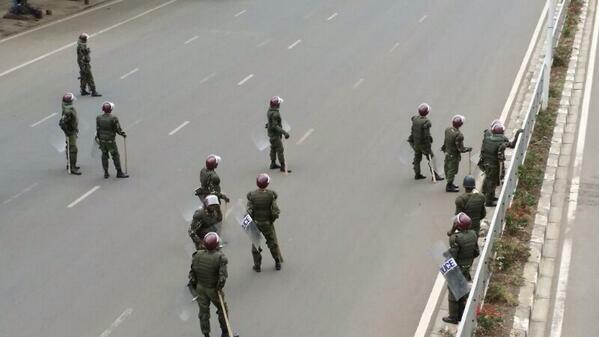 I don’t know who really knows what the level of threat is right now but I know my Kenyan colleagues are dismayed. Not just about the actual, horrendous bombings. But about how their country is being portrayed internationally and the effect this is having on vital industries such as tourism. It’s also hard to know what the Kenyan Government will do next. They have stepped up the night time raids of suspect suburbs and conducted mass arrests, picking up hundreds upon hundreds of people at a time. Carrying an ID card has always been compulsory here. But now police stand in certain areas stopping everyone that passes and the threat of arrest if you’re found without one, or with papers slightly out of order, is very real. Al Shabab’s line is the bombings are due to the presence of Kenyan troops in Somalia and it’s becoming increasingly common to hear people saying the Government should just withdraw. I don’t know if that option is even being considered politically but the tension between the Kenyan and Somali populations is growing ever more strained and hostile. Saying all this, it feels like these issues are limited to Nairobi and Mombasa. And even here normal life carries on and I have never felt unsafe. I just hope Kenya stops being in the news soon….